Stored procedures can provide major benefits in the areas of application performance, code re-use, security, and integrity. DB2® has offered ever-improving support for developing and operating stored procedures. This IBM® Redpaper™ publication is devoted to tools that can be used for accelerating the development and debugging process, in particular to the stored procedure support provided by the latest and fastest evolving IBM product: Data Studio. We discuss topics related to handling stored procedures across different platforms. 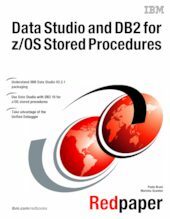 We concentrate on how to use tools for deployment of stored procedures on z/OS®, but most considerations apply to the other members of the DB2 family. This paper is a major update of Part 6, "Cool tools for an easier life," of the IBM Redbooks® publication DB2 9 for z/OS Stored Procedures: Through the CALL and Beyond, SG24-7604.